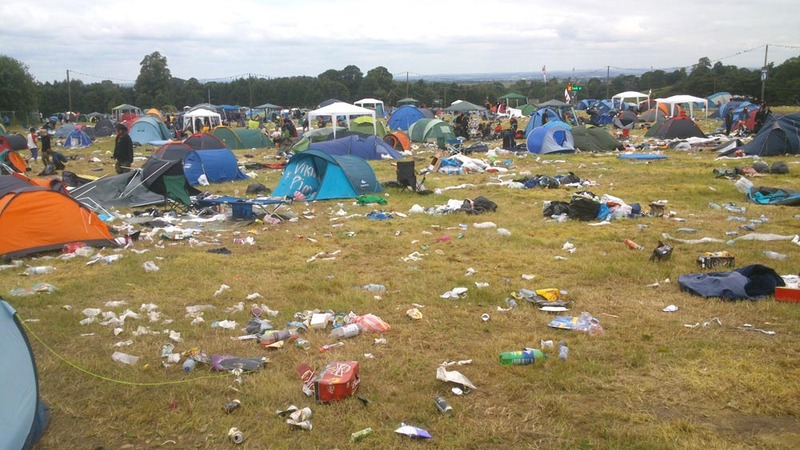 We are trying to raise awareness of the terrible state that the campsites are left in when everyone goes home after a Festival. Abandoned tents, camping equipment and rubbish blight the beautiful green fields which will be destined for landfill and will take years to decompose. Please do your bit when you leave. Take your tent and all of your camping gear home. Put all your rubbish into the bins provided and use the recycle bins to reduce the amount going into landfill. Even just five minutes of effort from each person at the Festival would make a HUGE difference. Also, please use the toilets provided rather than bushes or hedges. 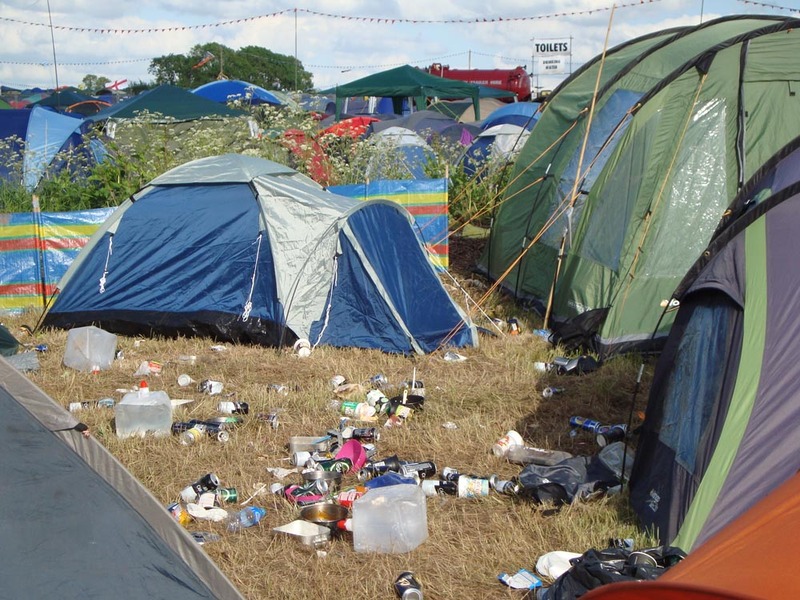 Thousands of tents and abandoned camping equipment like airbeds, roll mats, chairs, blankets and gazebos are left after each festival. Think responsibly when you are packing your bags, don’t bring items that you won’t be able to take back home again. If you are unable to take your tent or any of your camping equipment home with you, please bring it back to our stall where we will donate the items to charity. It costs nothing, prevents waste & pollution whilst supporting a worthy cause. Items must be in a clean and usable state in order to be taken in. The donation point (our ‘Fat Frank’s Camping Shop’ stall) will be open until 12 noon on the closing Monday of the festival. Pathways of Chesterfield a homeless charity. This charity and youth group will benefit from and tents and equipment donated and salvaged when the festival has finished. 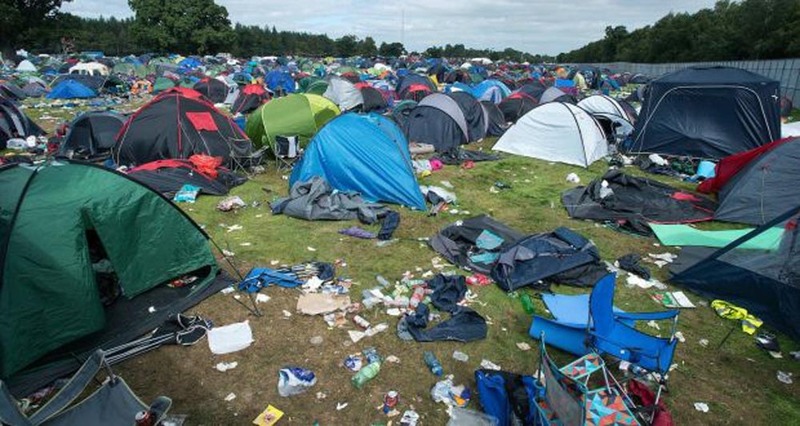 Please remove all your tent pegs from the ground. It is really important not to leave any behind because they get embedded in the ground and when the fields get rotavated, the metal pegs can get chopped-up into small pieces. This can lead to serious injury and harm to livestock using the fields. Order your festival gear online and collect it when you get there... Easy!